Hi there EpicDuelists! It’s your friendly neighborhood Cinderella, here to let you know about what we’ve got on the agenda for this week. 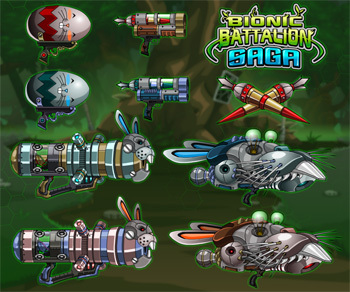 All the classic April Fools / Bunny-themed weapons and armors will be returning this update. Will Nightwraith’s BioDerp weapons (seen here: http://twitpic.com/8sj6wq) be placed in-game? I don’t know! Will there be a new bunny-type auxiliary weapon or sidearm? Maybe! Maybe we can bug Nightwraith to "Make it so!" These items and more will be available at Naomi in Central Station or Titan in the Bazaar! If you saw our livestream on Sunday, you know that RabbleFroth is rebalancing the stat modifiers and damage of the items in the game based on price, level, and damage. Since he didn’t put details in his document to which I have access *shakes fist at the sky* I don’t yet have the details for you. Unless he posted it in the forum and I missed it. The basic idea is that a standardized formula will be applied to all weapons to determine their power to eliminate the problem of having a clear "best" item at any given level. This forumula will give items a steadier power curve for each level. The Bionic Battalion Saga will be continuing this week. Brachylagus and Capensis are not the only rabbits preparing themselves for battle: Myxoma will have her day as well. It’s come to her attention that little clueless Lepus is still in the Biological Preserve, and Myxoma needs your help in preparing a rescue mission for Lepus. We may also be adding some new perma-missions, but I haven’t written any yet you’ll have to search for them! Like a treasure hunt! You may notice that our resident murderer-for-hire with a heart of gold is missing from his normal hangout. You’ll be able to find him this week in HeroSmash, where he’s been transported due to a personal teleporter accident (that's what happens when you text and warp!). 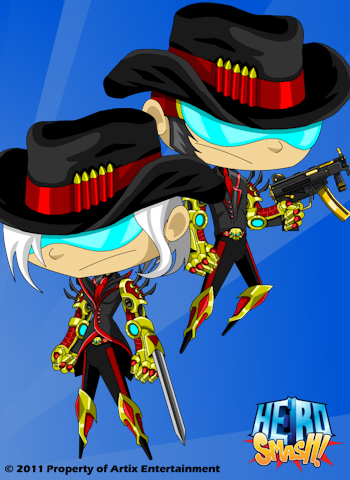 Be sure to check out his special HeroSmash gear, designed by Randor the Red, and his reaction to the world of HeroSmash. Nightwraith will be selling his awesome armor on Friday and will remain in for one week. Rumor has it that he may return for one day in November, but you never know. Those teleportation devices are notoriously finicky. Timey-whimey and all that. Stay tuned to the HeroSmash Design Notes for more information! Thank you to all of our wonderful players who participated in the first EpicDuel Artists livestream where all the EpicDuel development staff were in attendance! It was really great to be able to answer some of your questions, and you gave us a lot of ideas! Hopefully, our listeners got a better insight into the development process, as well! The whole thing is still available to view on the EpicDuel Artists channel on Livestream so check it out! In related news, give us your requests for songs we’ll be forced to sing well in advance. I think I still owe you guys, like, 5 songs. The call for Moderators is still ongoing- we’ve already made a list of some of the people we want to schedule an interview with, and we’ll be adding to that list as fast as I’m able to type it. Remember, patience is a vitrue we value when considering potential moderators, so sending e-mails asking if we've read your resume yet will affect our judgement of your application.